Maple bi-cut neck with a rosewood fingerboard steamed onto a 7.5 inch radius on the maple neck as on pre CBS Fenders. These basses were only produced in small numbers and this is a great all original example. 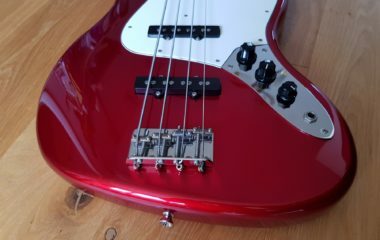 Extremely versatile bass, with a big range of sounds on offer and can do both Precision and Jazz. The neck and truss rod are both perfect, there are two small patches of missing lacquer behind the 12th fret, probably caused by a stand, no damage to the wood just no lacquer, there are some paint chips on the end of the body, again probably stand marks and one on the top edge of the body above the neck pickup, the neck pocket is good and the neck is a perfect fit. This is a lovely, high quality unusual vintage bass. Comes with a tatty but functional original hard case.